High fashion on high buildings: Another iconic building has been turned into an unusual catwalk by model and entrepreneur Jessica Minh Anh. Jessica Minh Anh ascending the Eiffel Tower in a couture dress by Dar Naseem AlAndalos. Hi, news from Jessica Minh Anh's unusual fashion project: Jessica has transformed the Eiffel Tower into a launch pad for haute couture fashion :P Although she had already performed two times in Paris on the river Seine, last Friday she reached another milestone by turning the symbol of Paris, the Eiffel Tower itself, into an unusual catwalk. J Fashion Shows aim to combine fashion, art, and culture with the best and most unconventional locations in the world like the Grand Canyon or the new One World Trade Center. The spectacular show in Paris took place on the entirely redesigned first floor of the Eiffel Tower, 57 meters above the city. 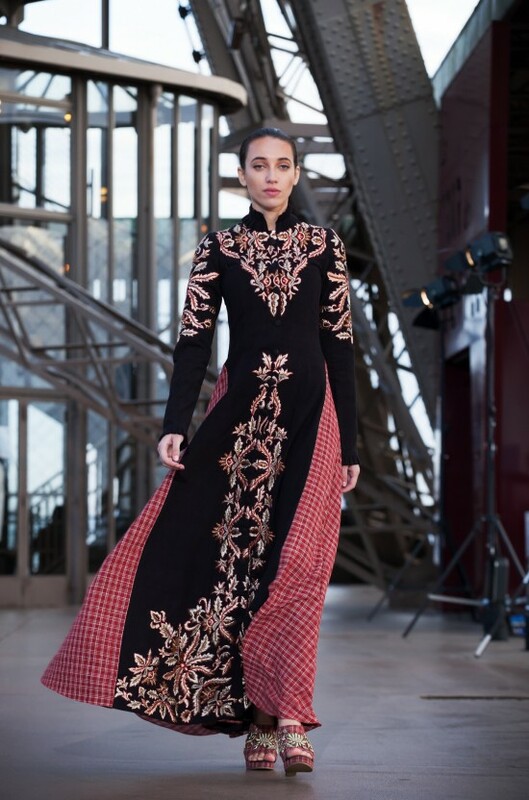 Fashion label Debaj from Qatar beautified the catwalk with Parisian elegance. Middle East brand OM Fiore blended Arab embroidery into European fabrics. Danish brand Soul Made Faroe Islands presented an authentic knitwear collection inspired by Nordic heritage. French fusion collection by Dar Naseem AlAndalos, based in Bahrain. A statement for strong independent women, by Indian fashion talent Shilpa Reddy. Signature look by Shilpa Reddy, worn by Jessica Minh Anh, combined a fitted military inspired blazer with sharply padded shoulders and a royal-emerald dress. The closing collection by Vietnamese haute couture designer Hoang Hai. Floor length lace dress by Hoang Hai. Hand beaded gown with transparency by Hoang Hai. Jessica Minh Anh and fashion designer Hoang Hai closing the show. Jessica Minh Anh in a dream-like white dress Hoang Hai on the Eiffel Tower. Which unconventional location will Jessica choose next? If she ever decides to come to Vienna, which building do you wish her to transform into a catwalk?